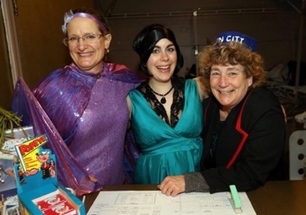 photo: Sin City Box Office volunteers Ruth McAllister, Kathy Trithardt, Jo Ann Cook courtesy of The Times Colonist. Auditions for new performers were held Jan. 6, 2019. Thanks to all who expressed interest and came out to play. If you are interested in submitting for a future round of auditions and have improv training and theatre experience, please send your acting resume and a note that describes your background, any special skills, and a headshot or casual photo and we will be in touch. ​Broad Theatrics Society 2019 Annual General Meeting took place place 7:30pm Wed. March 6 at James Bay New Horizons 234 Menzies.